If you want a high-quality and professional print for your project, it is important that you download the right file format best suited for print. Visme’s Printables category specializes in Print including posters, flyers, menu, invitations, postcards and business cards. Aside from this category, you can also print from any other visual contents or custom size. Click here to get information on printing an Infographic. To print from the printable category, you first need to login to your Visme account. In your Dashboard, click Create New on the top left of your screen to create a project. 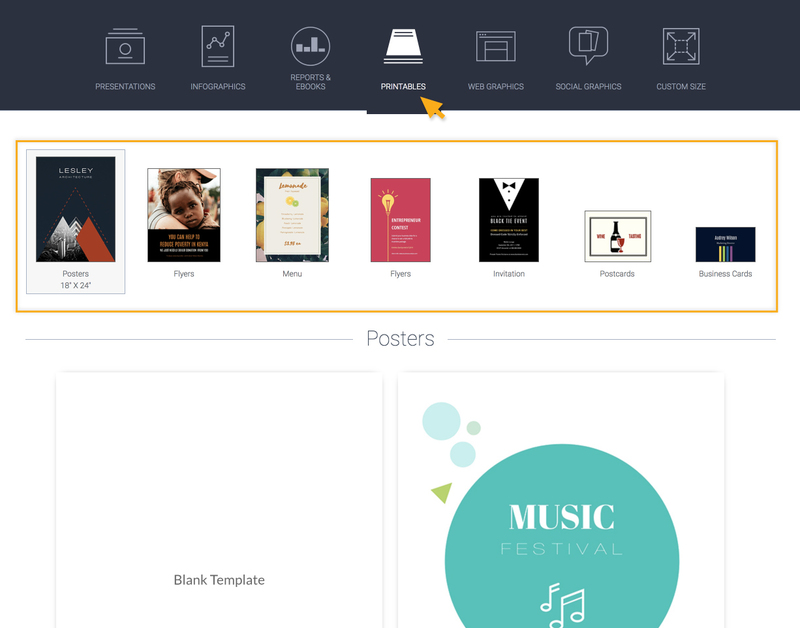 Select Printables category. Choose a design that you like and start designing. After you are done with your design, click Download at the top right corner of your screen to download your design. 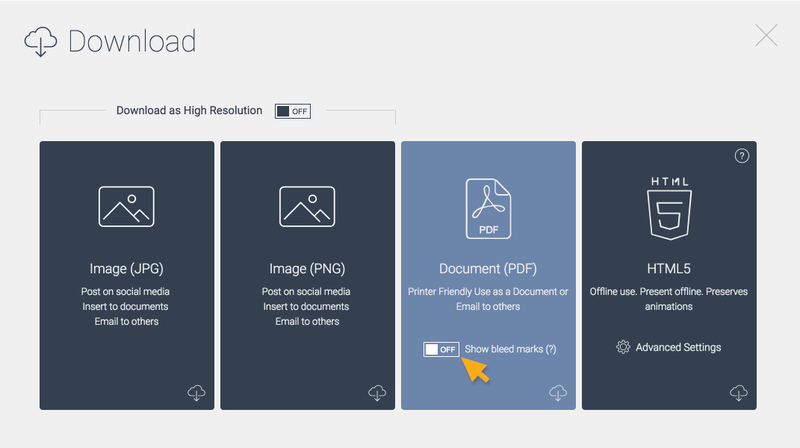 In the Download page, select Document (PDF) format as this will ensure professional print quality. JPG and PNG are not the best file format for print. However, JPG and PNG are great when uploading your project to the web since they are usually smaller in size compare to the PDF files. Learn more about working with PDI and resolutions in print. You can choose to turn on/off the bleed marks. Bleed marks is where the print goes beyond the edge of where the sheet will be trimmed (the area that will be trimmed off). When the bleed mark is on, you will see hairline rules that is outside of the defined page size. Learn more about crop marks and bleed. -The size of your design. -The quality of the assets you uploaded such as images (upload high resolution images or use large images). -The settings on your printer.